ベジタリアン！？ - different types of "vegetarian"
Do you know there are several types of vegetarian exist? Some vegetarians do eat eggs. Some so called vegetarians even eat fish! 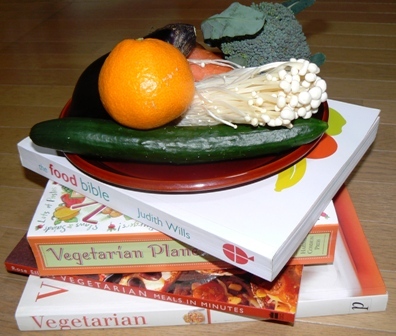 According to the Food Bible by Judith Wills (published by Quadrille Publishing in London), Demi-vegetarian will, apparently, eat everything except red meat. Sometimes poultry is also excluded, but fish is included, though may be eaten only infrequently. Lacto-ovo-vegetarian will eat all dairy produce and eggs, but no flesh of any kind. Whereas Lacto-vegetarian will eat all dairy produce, but no eggs or flesh of any kind. Vegans, however, eat only plant foods - no dairy produce of any kind, or eggs, or anything from an animal, including honey. The next lot is called Fruitarian who eats only fruits (at least 75% of diet), uncooked vegetables (mostly leafy kinds), raw nuts, seeds and beansprouts. If you think Fruitarian sounds weird, then Sproutarian sounds outright crazy! Sproutarian eats mostly sprouted seeds, grains, pulses and rice. The last two diets are not recommended by qualified nutritionists, as they will not meet full nutrient quota to maintain a healthy body. Anyway, let’s get back to a subject of “vegetarian” and fish. I remember a really funny incident that I witnessed at a Chinese restaurant in London a few years back. It happened at a lunch time buffet. I had stopped eating meat by then, but there were plenty to eat for me since there were loads of mouth watering vegetable dishes on the trestles alongside meat, rice and noodle dishes. The choice of seafood was limited, however, to one dish - steamed prawn dumpling. The said dumpling was clearly everyone’s favourite, as every time freshly steamed dumplings arrived on the trestle, everyone pounced on them. There was a lady who pounced on the dumplings as soon as they arrived and scooped up the entire dumplings onto her plate while everyone looked at her with horrified amazement. One of the waiters saw the incident and asked her to be considerate to others and return some of the dumplings back to the serving dish. Today is the 12th day of my pledge to eat veg 30 day challenge and I’m pleased to report that so far so good. I haven’t missed fish and seafood as much as I anticipated. A problem, however, is that it is quite tricky to avoid fish products altogether in <?xml:namespace prefix = st1 ns = "urn:schemas-microsoft-com:office:smarttags" />Japan. Even innocent looking miso soup quite often contains fish in its stock. You see, it is very common to use a combination of konbu (seaweed) and katsuo (bonito flake) stock for miso soup and any other soupy food and broth here. Another frequent difficulty a vegetarian faces in Japan is that most of the restaurants and food manufacturers are not really vegetarian friendly. In England, most of food products and restaurant menus that are suitable for vegetarian are clearly indicated. 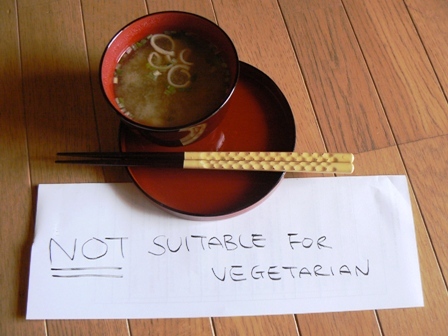 It makes our life so much easier, since all we need to look out for is a “suitable for vegetarian” sign, that’s all! Japan, however, is a potential vegetarian nightmare. You’ve got to check ingredients for everything you purchase, and it is a fact that most of the food stuffs contain either fish or meat products here. Eating out puts you in another predicament, unless you eat in a vegetarian restaurant. I was surprised to find, the other day, that chicken stock was commonly used for seemingly vegetarian menu such as vegetable curry! Every time I eat out, I ask a waiter whether my choice of dish doesn’t contain meat or meat products, and the waiter, in turn, always needs to check with the kitchen stuff. During this challenge, I have to ask about not only meat but also fish products as well! Anyway, as I said, I’m quite ok with not eating fish and seafood, but the truth be told, I do miss eggs! I don’t normally eat eggs much, but I do enjoy an occasional omelette and French toast. Unfortunately, most of the confectionaries like cakes and biscuits contain eggs as well. Needless to say, giving up eggs is quite hard-going for me.